When I was a little girl I would listen to my dad play the violin in the evenings before I went to bed. I loved listening to the music. My daughter inherited the violin and the case. In all her wisdom she took the violin to a fellow who restores antique instruments. He worked his magic and now the violin plays beautifully. But, the violin case was another story. According to the master repairman, after years of storage the old case was not the best place for a beautiful instrument. 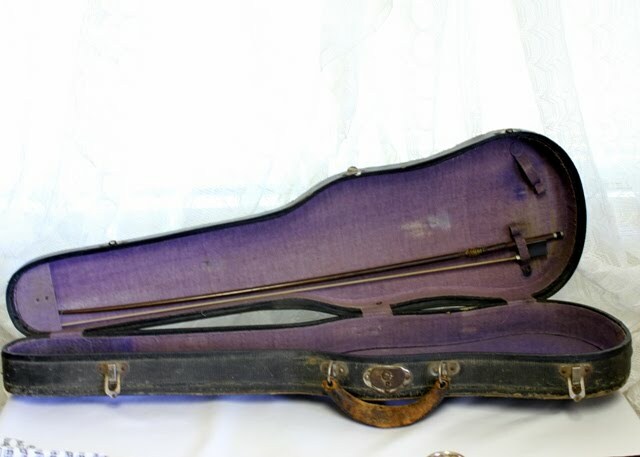 So I was lucky to receive the violin case and wanted to share the story of the violin case with you. Don't you think we need some dessert to go along with our violin story? I do. I set the table. The dessert and cordials are waiting. My dad started playing the violin about the age of 12. He played in the high school orchestra and when he was 17 he would take his fiddle, meet two friends who played guitars and they would have a jam session. They sure played some jazzy tunes in 1934. 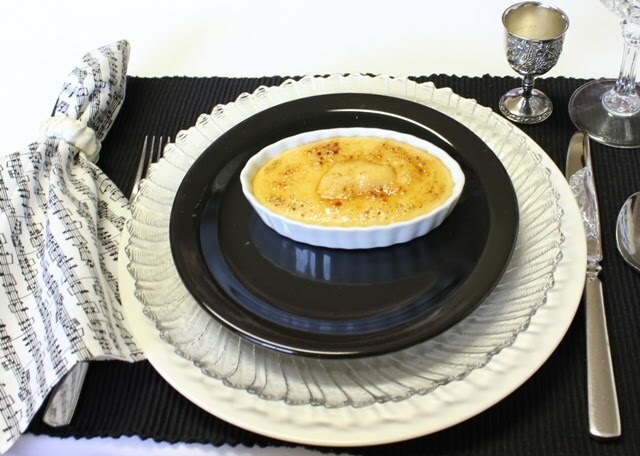 I thought you would love some Creme Brulee with your cordial. And a musical napkin to dab your lips. 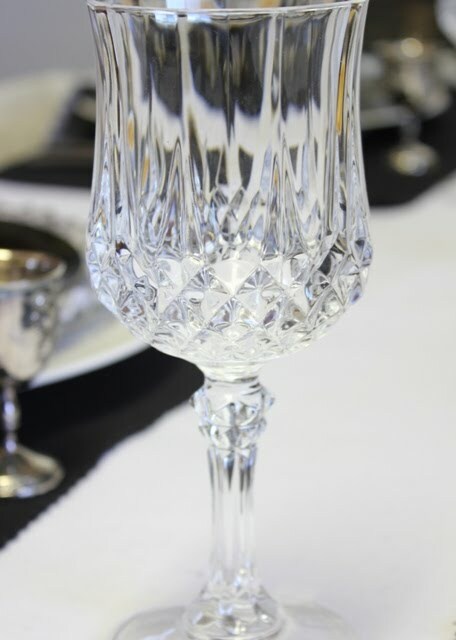 A beautiful glass for water. 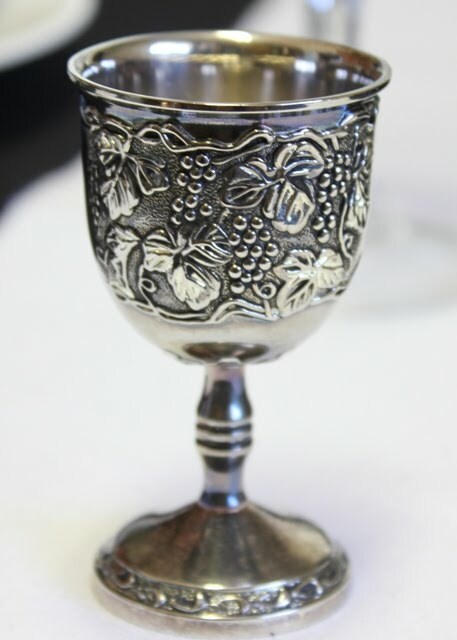 And of course a small silver cordial. I invited 'Sally Holmes' to the party. The rose bush is over 8 feet high and blooms all spring and summer long. It is amazing. I thought I would change the setting a bit. Which way do you like the napkin? And, that is the story of the violin case. The old bow is still in the case. The violin has a brand new bow. I hope you enjoyed your dessert and cordial. I have enjoyed sharing my story with you. Thank you again for stopping by for a visit. Please link back to the creative blogs and visit the wonderful posts. Very pretty, and such great history-enjoy! What a sweet story about the violin and case. 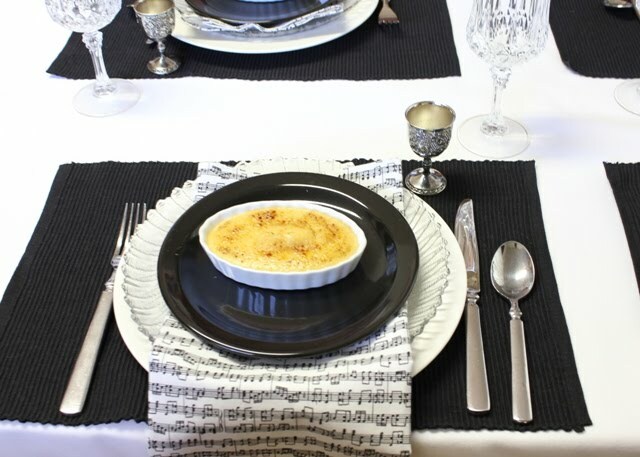 The music napkins are perfect for your dessert table. Have a great weekend, Betty. What a lovely story!! It was a delight to hear it and dessert and the table look luscious! Love your musical setting, the napkins are gorgeous!!! 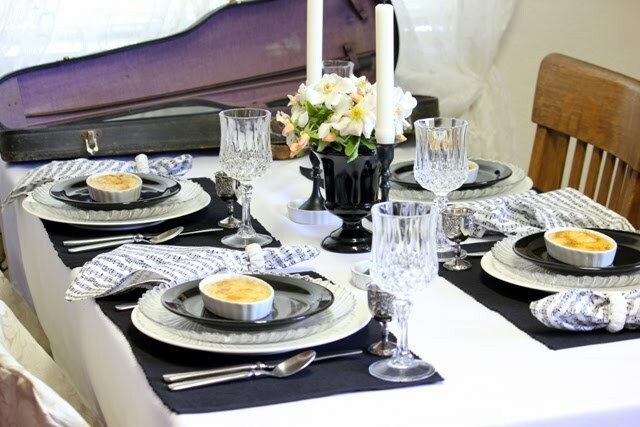 Oh my gosh, that is one of the most elegant tablescapes I have ever seen! I love music, have played the piano and guitar since I was about 7 years old. The case is so striking with the purple interior, I love the color combination! The napkins are adorable, you are so clever! Happy VTT! How beautiful, delicious and the violin case is a great look. Also I loved your story about your dad. Thank you for a lovely and interesting post today. Such a charming memory of your father! And such an elegant table. It is very pretty and I love the musical napkins, too. I would love a cordial and some dessert while I enjoy the music. Wonderful way to bring history to the table. It's all so pretty. I love this! Thank you so much for joining my Inspiration Friday Party! 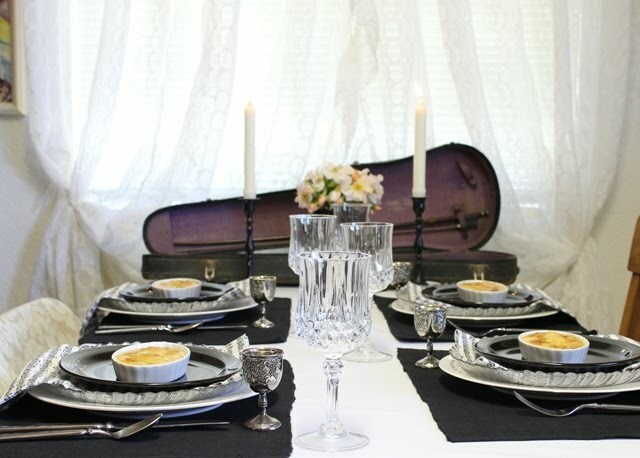 The story behind the violin case is wonderful and that Creme Brulee made my mouth water! It's my favorite dessert. It is the memories that make the meal together so much more meaningful! That is such a beautiful story... I bet you don't care at all that the case has been separated from that wonderful instrument... Classical violin is my "FAVORITE" music. I get lost in it! How luck you are to have those memories of your Dad! I love your table setting it is "like Fine Music"! This is a true treasure and it just "makes" the whole tablescape. I love the musical theme, but I love the story the best. I'm so glad that I stopped by here to enjoy it all. A nice story. I prefer the napkins on the side myself. Where do you display the case? It would look nice on an art easel opened up with some old sheet music in it too. What a fabulous tablescape - I love the theme and the colors. I love the music theme!! Love a little soiree! It looks very sophisticated and I'm licking my lips at just the thoughts of creme brulee...thanks for the pretty napkin! Thank you, thank you, thank you!!! I love those music napkins and know exactly who will receive them when I make them. (Even I should be able to make these...) My sister will LOVE them for her birthday...she is an opera singer (retired), plays every stringed instrument, and cannot read music! It's all by ear.... She's amazing! 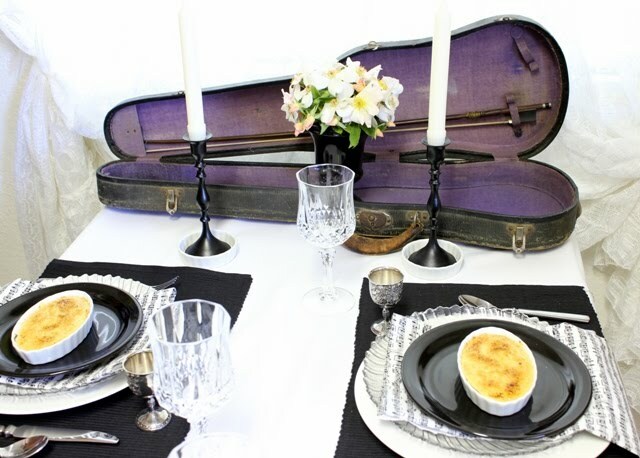 Loved the story and how the violin case inspired your tablescape. Just love this!! I adore your napkins and the violin case is to die for!! Lovely story. What a great case and bow. 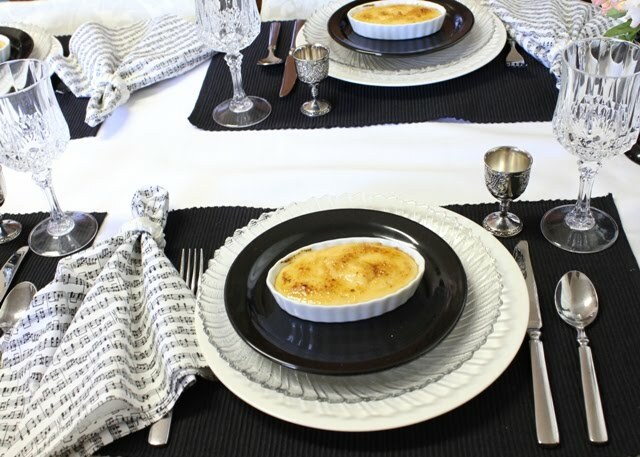 That creme brulee looks delicious and your tablescape is awesome! Betty, what a wonderful story and I LOVE the violin case for your table!!! I play the violin, so your blog post for Show and Tell Friday was my first hit! 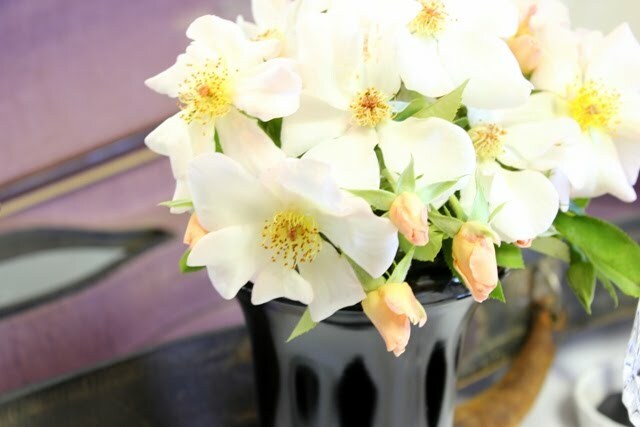 I'm so glad to be a follower of your blog now! Thanks so much for sharing that with us!! Love the table settings and the violin story! Oh and the Creme Brulee looks devine! Great work! This is beautiful. I am hosting a 50 dollar CSN Giveaway on my blog. I would love for you to stop by. Thanks Anu! Betty, I have an old violin, but with no case and no bow.. Do you want to sell the old case and the old bow and then I could have a complete set..?